After years of toying around (unsuccessfully) with statistical models for the K League, the greatest thing in the world happened last week. The K League released a public and free center with access to more statistics than you could ever imagine, some over a 20 year period. It was like Christmas came early. In this post, we’ll keep things simple. There’s no real aim or conclusion for this post except learning more about each team’s statistical anomalies and particularities. We’ll do one interesting statistic for each K League 1 team (sorry K2) and explore the treasure trove that is the K League Data Centre Heaven together. Something the K League neglected to mention is that some of the 2018 data samples are only from the past 6 games; and others from the entire season. I’ve tried to filter through them and compare apples to apples, but still, take these with a (tiny) grain of salt. They’re more of a snapshot in time than a holistic view. Data again from the K League Data Centre supplied by Opta. It’s a well-established fact that K League teams tend to play more on the direct side, especially when they have a dearth of talent. Gangwon is no exception, except they just seem to do it much better than the others. 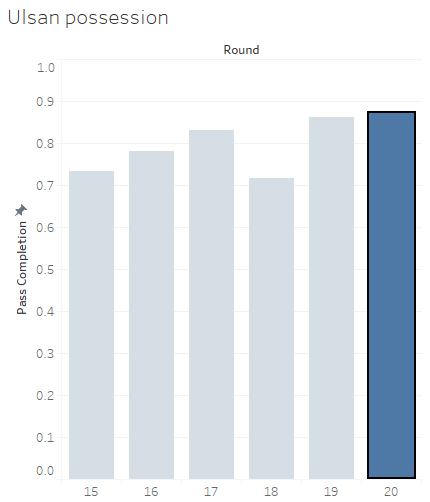 In the past six games, they’ve won the 2nd the most aerial duels and ground duels in the league, and made the most long balls and penetration of the final third (presumably with all of these long balls). Value on the left is a percentage of all occurrences of that statistic in the league. The main recipient of their average 45 long balls per game is 6ft5 Bosnian forward Uros Deric, who leads the league in scoring in 16 goals. But beyond those numbers, he’s proven to be an exceptional target man, leading the league in aerial and ground challenges (winning close to a combined 7 per match). He’s also top 5 in fouls, which is usually a hint of an elbows up kind of forward. The first hint that the data didn’t cover the entire K League season (as I had hoped) was how good Incheon’s numbers were in specific fields; take-ons (1st), clearances (1st), tackles (1st) and interceptions (6th). Last year, they were 11th, N/A, 9th and 8th in those fields. New boss Jorn Andersen seems to set up his sides to be very hard working and aggressive, both in offense and in defense, and it has led to some spectacular scorelines (3-3 D vs Jeonbuk, 3-3 D vs Gangwon, 2-5 L vs Suwon, 0-3 L vs Gyeongnam) but also a string of two consecutive victories. K League Data Portal, Incheon 2-5 Suwon Downwards-pointing triangles are take-ons; red for unsuccessful, green for successful Upwards-pointing triangles are tackles and interceptions; blue for interceptions, and green for tackles. 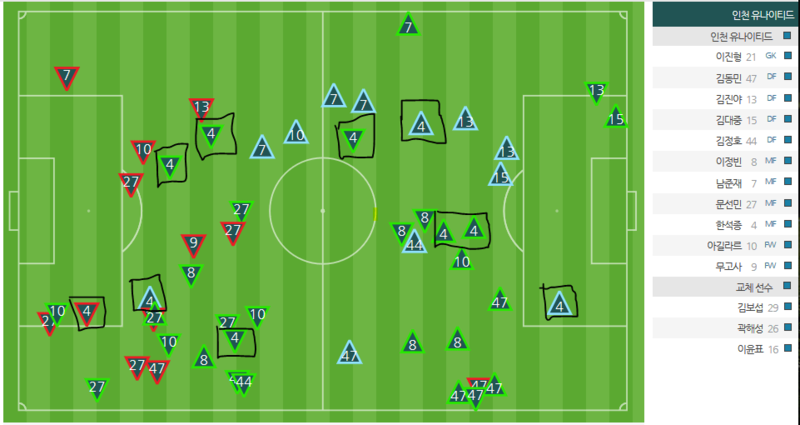 Incheon’s activity in the take-on, tackles and interceptions fields in their somewhat hilarious but entertaining 5-2 loss to Suwon reveals some of Andersen’s organized(?) chaos. Box-to-box midfielders seem to be very much in fashion. 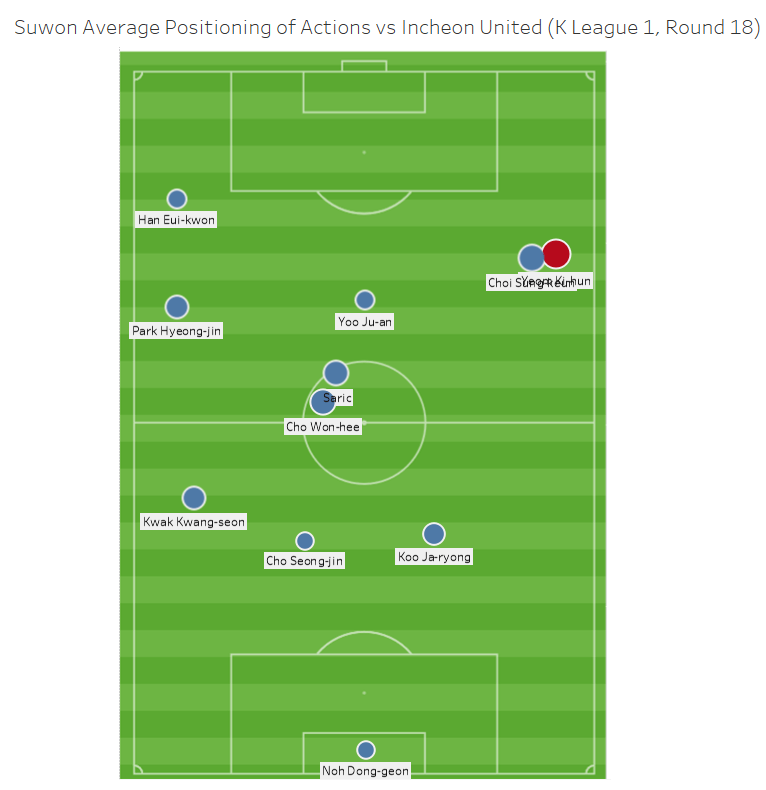 Han Seok-jong’s interventions are unprofessionally indicated above; he made 4/5 take-ons, 2 tackles and 3 interceptions literally all over the pitch. #7 Nam Jun-jae was also very active up and down the right side, #8 Lee Jung-bin the same on the left side. 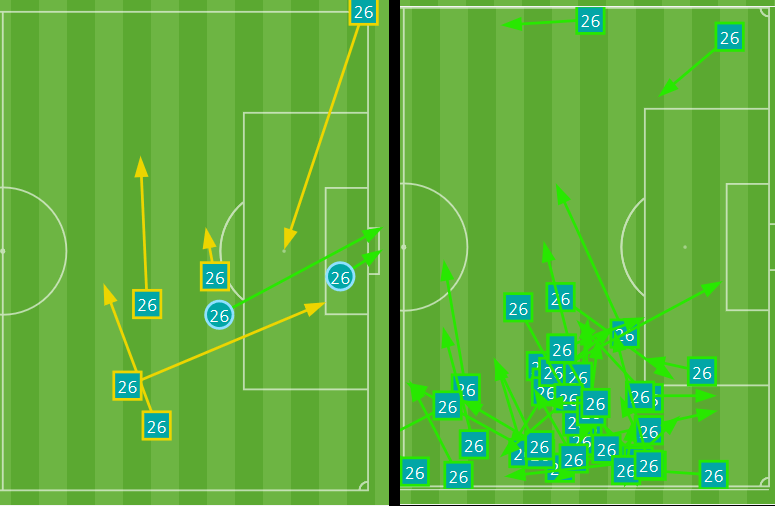 World Cup attendee Moon Seon-min (#27) attempted 8 take-ons in the same match (though only succeeding two). The bottom line: long-ball football is out of Munhak Stadium, with Andersen’s team attempting the least punts forward in the league since he took over! I haven’t watched a lot of Pohang this season, but the numbers don’t lie on a couple fronts; they’re a team that really enjoys having the ball, and that doesn’t do much with it. Hence the laziest nickname for them is “Bad KNT”. Across the entire season, Pohang have had the most possession (averaging 53.2%), and, in the past six games, have been in the top three for total passes, final third passes, middle third passes, defensive final third passes, forward passes, backward passes and long balls. The problem is they don’t do anything with it. 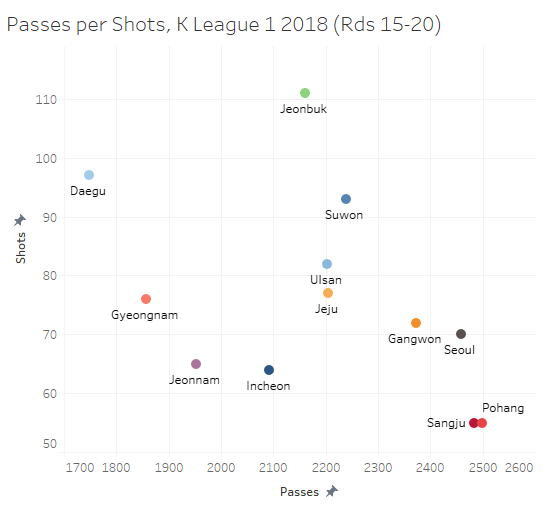 Whereas most teams have shot the ball around 60-80 times from around 2100 passes in the past 6 matchdays (oh hi, Daegu and Jeonbuk, you crazy shooters you), Pohang and Sangju like to pass a lot and shoot very little. For Sangju, it seems to be more of a form thing limited to this sample, but for Pohang, it’s a trend: only 4 shots on target per match throughout the whole year. A reason? 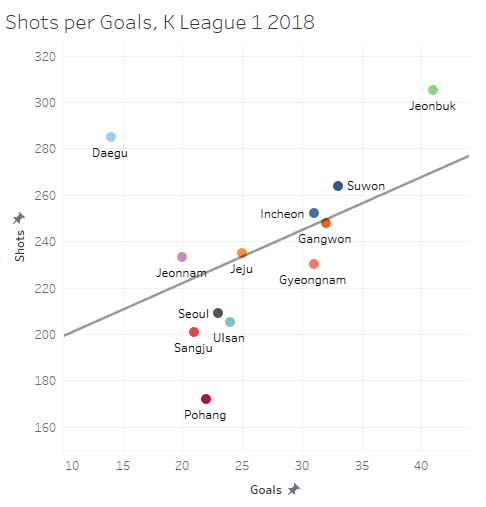 Pohang’s firing squad is under strict instructions not to shoot from distance (only 124 shots from outside the box all season — that’s a whole 33 shots below Seoul, who are in 11th). Don’t be fooled by their 7th place ranking; of Pohang’s 6 season wins, 4 have been against 11th-place Jeonnam and 12th-place Daegu. 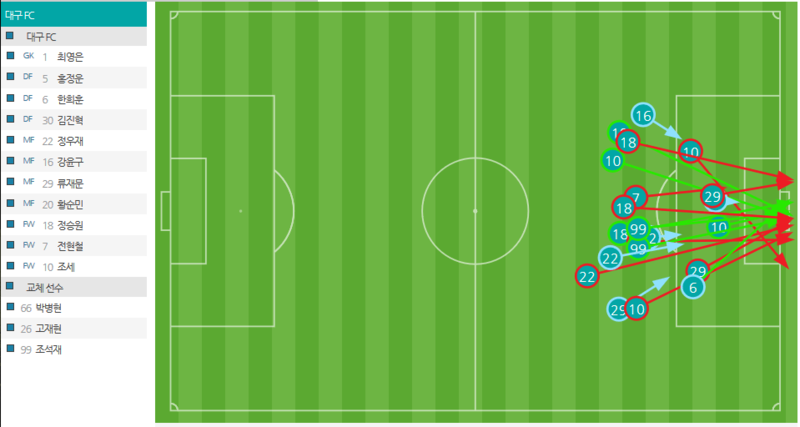 Against Jeonbuk on the last matchday, Daegu took 22 shots, only 5 of which were from inside the 18 yard box. 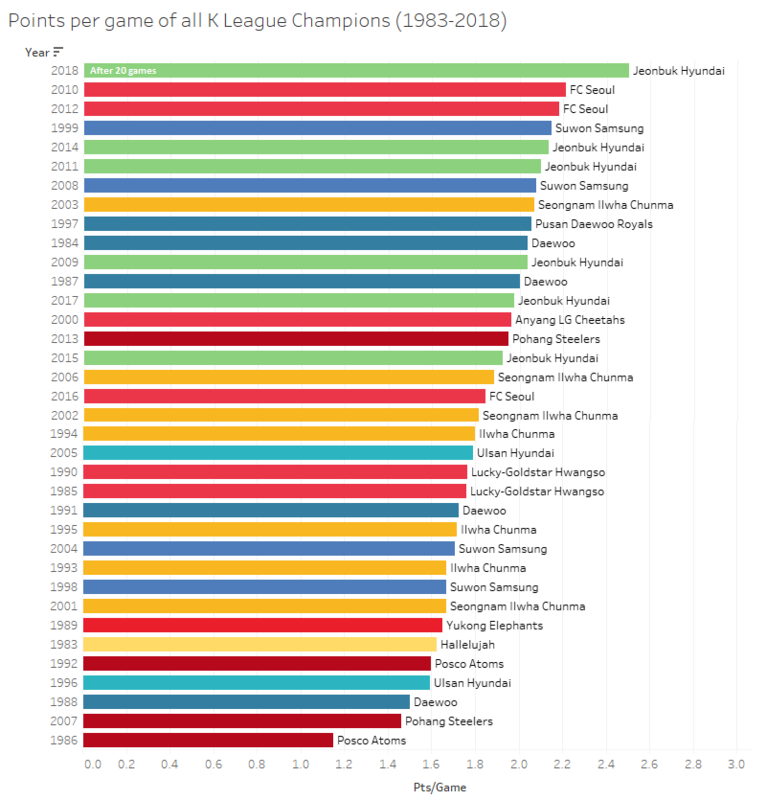 Given that the major European leagues statistically converge on around 10-15% of all goals coming from outside of the box, and given that Daegu are dead last in the league, you’d wonder if being a bit more patient in the final third and trying to create a better quality chance would serve them better. Jeju are a side that is very comfortable shooting from distance. 85% of their shots come from outside of the box, tied for most in the league, and only 37% of their shots are on target, tied for worst in the league. Close to one-fifth of their total shots come from Lee Chang-min, who is known for banging goals in from distance for club and country. Among all players with 40 shots or more, Lee has taken the most from outside of the box (95%). In the past 6 games, he took 20 of those shots, and as plotted above. The conversion rate isn’t great (1/20) but it’s something Jeju can more or less afford to do, giving that they’re sitting in 4th in the table. Seoul: The Most Erratic Defense? Seoul sit at 9th in the table at the present time and look a shell of their usual selves. Though there’s pieces lacking in all parts of the field, Seoul’s defense seems particularly vulnerable and erratic. In the three major defensive statistics – clearances, interceptions and tackles – Seoul struggles – but in the major disciplinary ones – fouls and yellow cards – suddenly Seoul’s share of the league’s foul play soars. Is Seoul’s defense erratic, or just very reactive? Gyeongnam’s improbable ascension to 2nd place in the league table is due to the riveting success of their target man forward Marcao. In aerial challenges and ground challenges, the Brazilian is in 2nd place, but he’s also 2nd on shots inside the box and in total goals. 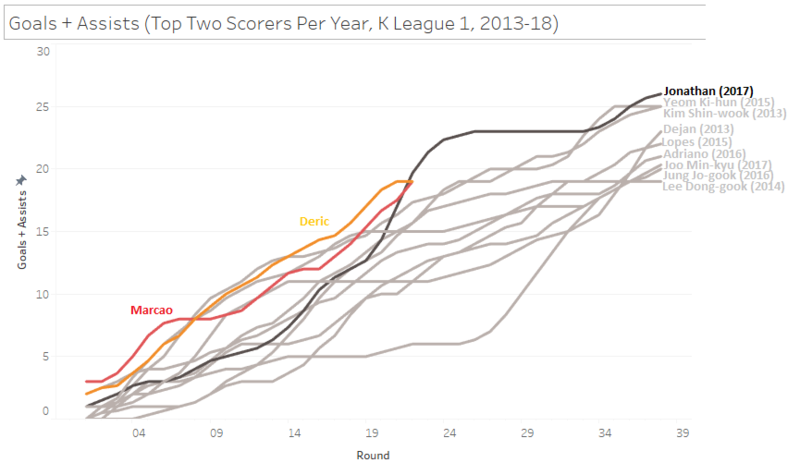 Indeed, he and Deric (of Gangwon, mentioned above) could well become the two most statistically dominant first-division forwards since the K League split to two tiers. They are well on Jonathan’s pace last year – the former Suwon Bluewings forward finished with 26 goals and assists – and if either of them don’t lose form then they can well surpass it. What will make Marcao’s achievements even more impressive is that he is doing all this with a recently promoted team who takes only 44% of possession on average – the worst in the league. If it wasn’t for Jeonbuk’s monopoly, he’d be Vardy and Gyeongnam would be Leicester. Jeonnam are pretty bad at scoring goals. Having only found the back of the net 20 times in 20 games (in a high-scoring league), numbers reveal some worrying metrics about their offensive output in the final third. Beyond simply the fact that none of their players have more than 3 goals, their top shooter Wanderson has a conversion rate of 2/41 and that they only have 5 goals in the first half this year, the Dragons also fail to penetrate and exploit the final third in any way. Unable to pierce the final third or do anything of note, and with very little transfer activity to change this stat, the Dragons may well be facing the drop. Not to mention that their 55 key passes in 6 games is a league-wide low. Though he’s 35 years old, and his minutes have to be managed, Suwon are still Yeom Ki-hun’s team. After close to 9 years of service (interrupted only for Police duty) for the Bluewings, Yeom’s consistently good numbers and offensive contributions are hard to compare at his age. Such was his end-of-career resurgence that he was almost selected to the World Cup squad nearly 12 years after he made his KNT debut. This season, Yeom is playing as somewhat of an inverted winger in a 3-4-3. The best left foot in the K League operates down the right and is very much the side’s focal point. In red is Yeom Ki-hun, who with 90 touches took the most in the match. By comparison, left-winger Han Eui-kwon (former Daejeon Citizen~~) took only 34 (and looks somewhat isolated). It isn’t because of Choi Sung-keun, the RWB, that Suwon is right-heavy, but Yeom Ki-hun, who uses his inverted winger role to play balls into the right half-space and the middle of the pitch. In the 5-2 win over Incheon, he scored 2, set up 1 and made 4 key passes with an 82.3% completion rate. Ulsan has felt all season like a side that doesn’t really excel at anything, at the baseline statistics reveal that in the 30 different statistical fields that K League Data Portal and other sources (that I’ve compiled) has tracked, Ulsan cracks the top three in none of them. Making them a really annoying team to write about in this post. Ulsan may try to ascend out of the realm of statistical boring-ness by bolstering their midfield; signing former NYCFC midfielder Mix Diskerud (short, strangely very political interview here) seems to hint at this. Whereas Park Yong-woo’s central midfield partner has seen far less of the ball in previous games, Ulsan’s decision to acquire Diskerud’s services resulted in an immediate uptick in midfield passing and the team’s overall pass completion. We’ll have to see if this continues, and more importantly if it results in Ulsan being more of a dangerous opponent rather than a midfield sleeper. That’s a graphical representation of all the shots on target by their strikers (Lee Gwang-sun, on loan from Jeju, and Shin Chang-moo, on loan from Daegu) in the past six games. 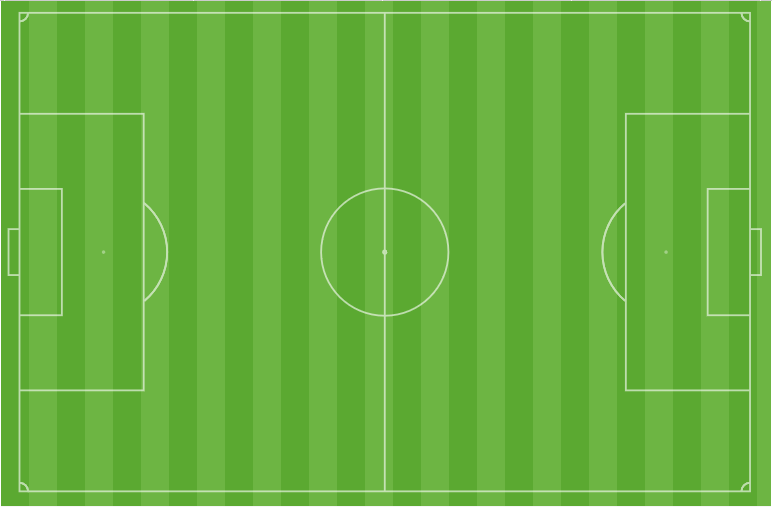 Even if we were to add shots off target, it would only add one effort that ended up near the corner flag. Granted, Sangju play a lot like Pohang (statistically), passing a lot and building-up from their defensive third. But the absence of Joo Min-kyu, who is injured, has exposed the Korean striker problem; there’s very few good Korean centre forwards in the league, and none of them clearly are in this batch of soldiers. Jeonbuk: Good at Bloody Everything; Maybe The Best Ever? Okay, so I got a bit lazy with Sangju, but that’s because there’s so many good things that Jeonbuk does that you don’t know where to start. They have four forwards with over 6 goals (Lee Dong-gook, Adriano, Kim Shin-wook and Lopes), Song Bum-keon and his defense has kept 15 clean sheets, and they lead the league in shots, shots on target, shots from inside the penalty box, penetration of the final third, forwards passes and key passes — all areas that they easily dominate, and all areas that are indicative of a bloody good team. They also lead the league in crosses (Kim Shin-wook’s head: aim here) and Lee Yong, yes, KNT Lee Yong – a fullback – leads the league in assists. I can’t recall the last time a defender could win the assist award. So the real macro-level question then is: could they become the best team… ever? And when compared to every K League champion since the beginning of professional club football in Korea, the answer is… yes. 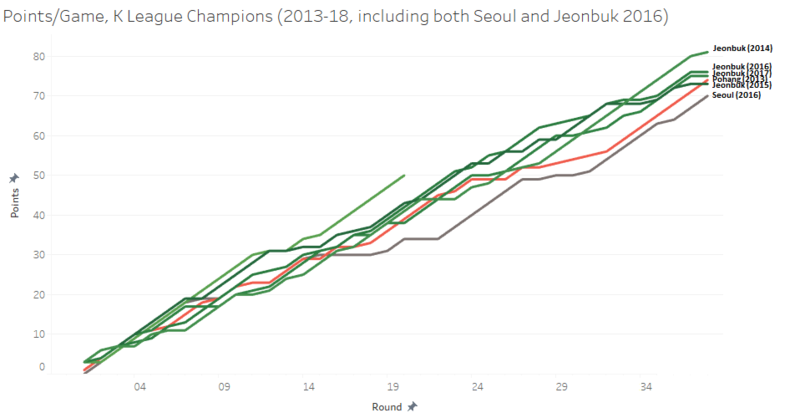 Trend lines are even suggesting that Jeonbuk could well be on their way to scoring in excess of 95 points at the end of this season at the current rate. Jeonbuk are still in the Korean FA Cup and are in the quarter-finals Asian Champions League. No Korean team has ever won this treble; and yet you can’t write Jeonbuk 2018 off from becoming the greatest side in Korean football history at this point. They’re that good. I hope you enjoyed this behemoth of a stats piece as much as I did making it; future pieces will probably focus more on one player, one team or one metric, so I won’t be making your head spin as much. I hope these numbers piqued your curiosity in the K League, or reaffirmed what you already knew. Definitely download the Naver TV App – K League games are no longer geo-blocked in Canada and the USA – and you can also check out the K League Worldwide Live game in a few hours (upon publishing) where #1 Jeonbuk takes on #2 Gyeongnam. If you have any requests for a player or a team’s stats, then let me know in the comments below, more than happy to oblige! WOW!!!! Great article Tim, really interesting insight. No one can stop Marcao. Jeonbuk lost LJS to Holstein Kiel, how would that affect them going into next fixtures including the league, domestic cup, and AFC champions league? This will be very interesting to see! They just lost to Gyeongnam and maybe they will struggle to replace his creation of attacking chances? We will certainly have to keep an eye on this!